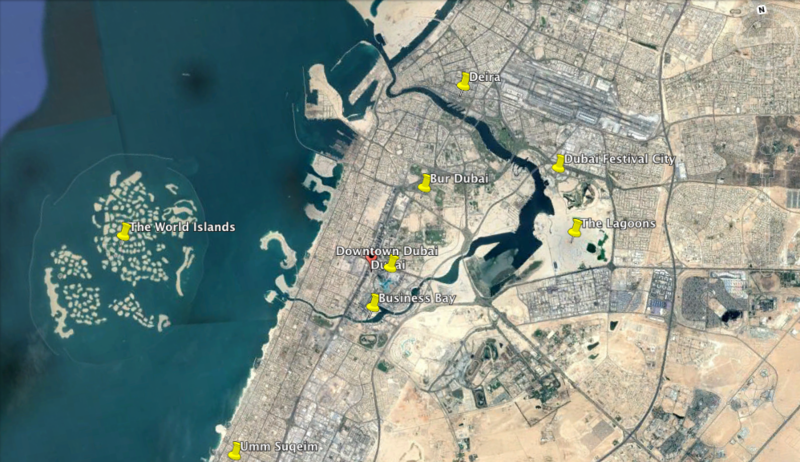 Dubai is mostly built along the coast, and with a lot of projects expanding into the sea such as Palm Jumeirah, The World Islands, and Deira Islands. 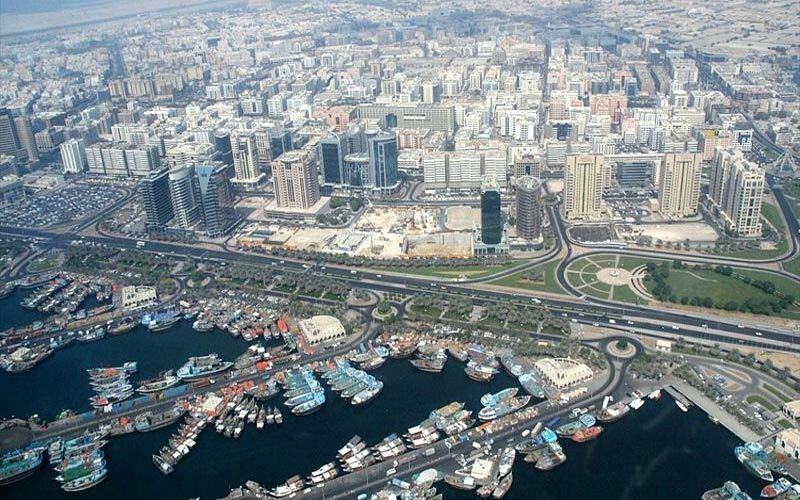 The city has a lot of different exciting areas like Deira and Bur Dubai, which is the old part of Dubai. On the other side of Downtown Dubai there is Dubai Marina and Jumeirah Lake Towers with fascinating sky scrapers. Deira: North of the Creek lies Deira, which is the second of the old city’s two principal districts, founded in 1841, when settlers from Bur Dubai crossed the Creek to establish a new village in the area. Deira rapidly overtook its older neighbor in commercial importance and remains notably more built-up and cosmopolitan, with a heady ethnic mix of Emiratis, Gulf Arabs, Iranians, Indians, Pakistanis and Somalis thronging its packed streets, along with African gold traders and camera-toting Western tourists. Specific attractions are thin on the ground, but this remains the city’s best place for aimless wandering and even a short exploration will uncover a great mix of cultures, with Indian curry houses jostling for space with Iranian grocers, Somali shisha-cafés and backstreet mosques – not to mention an endless array of shops selling everything from the formal black abaya to belly-dancing costumes. For the visitor, Deira’s main attraction is its old souks – most obviously the famous Gold Souk and the small but atmospheric Spice Souk – although in many ways the entire quarter is one enormous bazaar through which it’s possible to wander for mile after mile without ever surfacing. Bur Dubai: On the southern side of the Dubai Creek, the district of Bur Dubai is the oldest part of the city, and in many ways still the most interesting area. This is where you will find all the bits of old Dubai that survived the rapid development of the 1960s and 1970s, and parts of the area’s historic waterfront still retain their engagingly old-fashioned appearance, with a quaint tangle of sand-colored buildings and a distinctively Arabian skyline, spiked with dozens of wind towers. Away from the Creek the district is more modern, where the lively Al Fahidi Street is a great example, lined with neon-lit stores stacked high with phones and watches. This is also where you will get the strongest sense of Bur Dubai’s status as the city’s Little India, with dozens of no-frills curry houses, window displays full of glittery saris, and optimistic touts offering fake watches or a “nice pashmina”. Much of the charm of Bur Dubai lies in simply wandering along the waterfront and through the busy backstreets, although there are a number of specific attractions worth exploring. At the heart of the district, the Dubai Museum offers an excellent introduction to the history of Dubai, culture and customs, while the old Iranian quarter of Bastakiya nearby is home to the city’s most impressive collection of traditional buildings, topped with dozens of wind towers. Heading west along the Creek, the old-fashioned Textile Souk is one of the prettiest in the city. 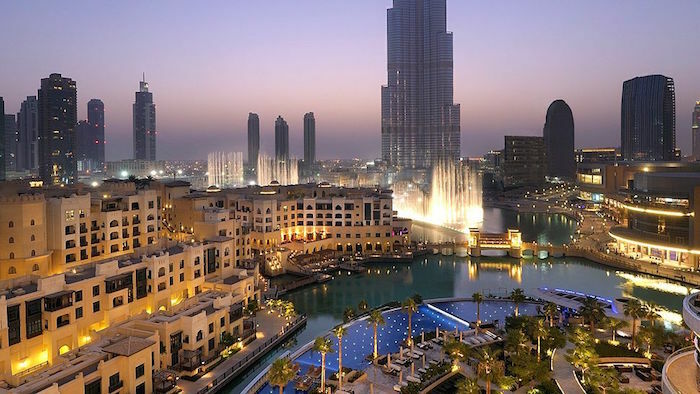 Dubai Festival City: Located along the famous and historic Dubai Creek, the Dubai City Festival Mall is conveniently located near Dubai International Airport and the historic city center of Deira. It is indeed a city in its own rights; it’s more a case of what it hasn’t got rather than what it has. There is no indoor ski slope yet, you need to go to the Mall of the Emirates for that, but with an extensive variety of shops, restaurants and entertainment options it pretty much has everything else is catered for. The design and location of the Dubai Festival City Mall combine stunning architecture with glittering water and the greens of its golf course set off the image perfectly. Dubai City Festival Mall has been well designed to provide an impression of space and calm even when extremely busy. Downtown Dubai/Business Bay: Around 5km south of the Creek, the upwardly mobile suburbs of modern Dubai begin in spectacular style with the skyscrapers of Sheikh Zayed Road, DIFC and the huge Downtown Dubai development: an extraordinary sequence of neck-cricking high-rises which march south from the landmark Emirates Towers to the cloud-capped Burj Khalifa, the world’s tallest building. This is the modern city at its most futuristic and extraordinary, and perhaps the defining example of Dubai’s insatiable desire to offer more luxury, more glitz and more retail opportunities than the competition, with a string of record-breaking attractions which now include not just the world’s highest building but also its largest mall, tallest hotel and biggest fountain. Heading into the heart of the city, it’s hard to miss Downtown Dubai’s key bragging rights: The Dubai Mall (the world’s largest mall and most visited shopping and leisure site), the Burj Khalifa (the tallest building) and the JW Marriot Marquis (the tallest hotel). Record-breakers aside, visitors will find a score of family-friendly activities including the Dubai Fountains, the Dubai Aquarium and Underwater Zoo, Dubai Ice Rink and The Souk. 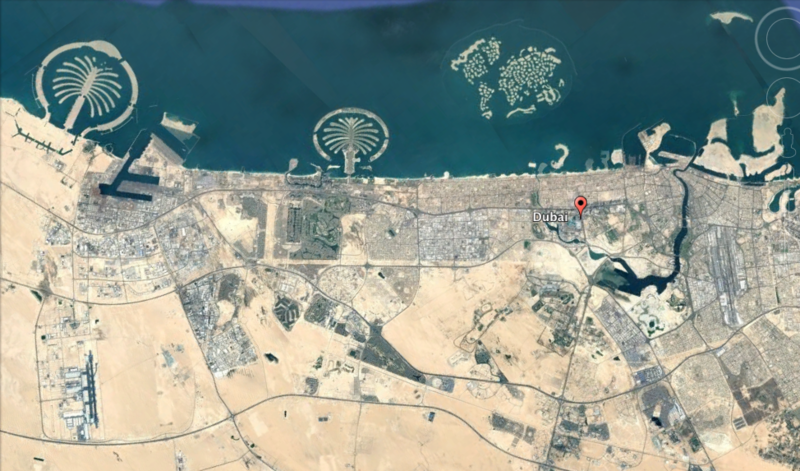 The World Islands: The World or The World Islands is an artificial archipelago of various small islands constructed in the rough shape of a world map, located in the waters of the Persian Gulf, 4.0 kilometers off the coast of Dubai. The construction on the islands slowed down during the financial crisis, however, the activity is starting again and a few islands are being developed with hotels and as private escapes. Umm Suqeim: A long stretch of shoreline that runs parallel to Sheikh Zayed Road, Jumeirah Beach is the address of a number of the city’s landmarks, including the iconic seven star Burj Al Arab hotel, the Madinat Jumeirah resort and entertainment complex and its attached souk, and Wild Wadi Water Park. The beach next to Jumeirah Beach Hotel is the perfect place to get a nice tan, as well as getting a few shots of the mesmerizing Burj Al Arab standing in the sea on a man-made island. Palm Jumeirah: One of the city’s most recognizable landmarks, Palm Jumeirah tops the lists of most visitors’ to-do lists. One of the world’s largest man-made islands is home to another unique attraction – the seashell-pink arches and turrets of the Atlantis Hotel, visible to travelers driving up the island’s main road. 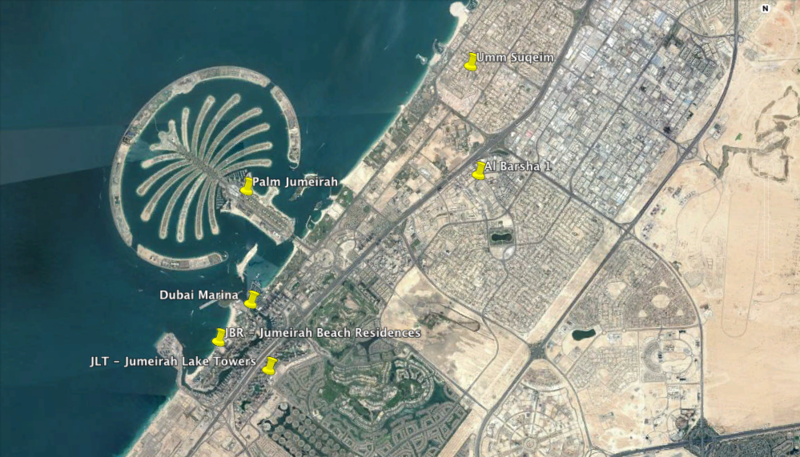 High-end hotels are a drawcard, with international hotels such as Anantara, Fairmont and Waldorf Astoria represented along The Palm’s Trunk (otherwise known as The Golden Mile), outer Crescent (residential villas populate the Palm’s fronds). Even if you have chosen not to stay on The Palm, the iconic district is worth a visit for the fine-dining restaurants, luxurious spas, beautiful beach clubs and unfettered views of the Gulf’s waters. From both the East and West Crescents you can get some of the best views of the Dubai skyline. Dubai Marina/JBR: Take a tram up two stops from JBR (for Dhs 5), or a short taxi ride (Dhs 20-25), to the Dubai Marina Mall that sits front and centre of the impressive Dubai Marina district. Walk through to get to the docks, where there is al fresco seating at most of the water-facing restaurants. See how the marina’s waters reflect the surrounding high rises, including the twisting, 90-degree profile of the iconic Cayan Tower. Here, most restaurants are open past midnight, and a merry-go-round and pop-up stalls are there to entertain the whole family to and after dinner. 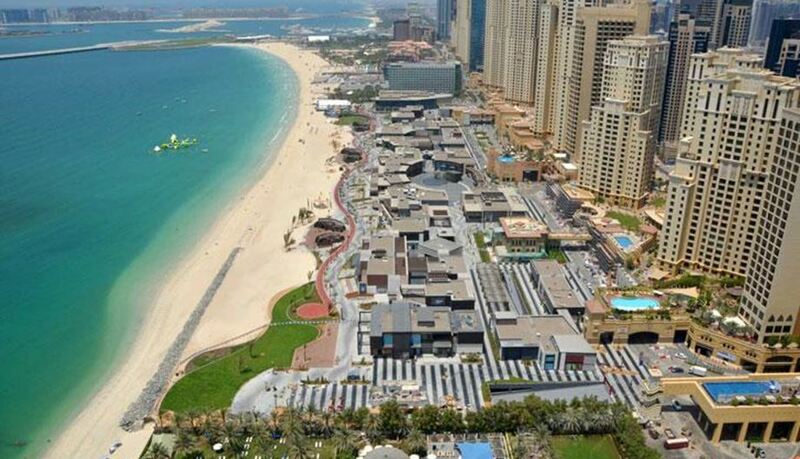 On the other side you will find Jumeirah Beach Residences (known as JBR to the locals), the district includes The Beach, one of Dubai’s newest family-friendly pedestrian malls. Visitors will find it too easy to spend an entire day – and indeed most of the evening – at The Beach, with hundreds of restaurants, retailers, and a cinema. A few steps away, beachgoers can roll out a picnic blanket, and nearby is an imaginative children’s playground and fitness equipment. Jumeirah Lake Towers: Opposite the Dubai Marina is Jumeirah Lake Towers, a maze of glass residential and office towers, and the green man-made lakes the district is named for. While formerly a relatively quiet area, JLT is now seeing well-deserved attention from outside visitors for its selection of one-off cafes such as the recently opened Friends’ Avenue and family-run expat restaurants such as the well-regarded Chinese kitchen Homey and rambunctious drinking holes such as the Moevenpick Hotel’s Urban Bar & Kitchen. A new landscaping project that has introduced lush lawns, interactive children’s playground and regular community activities and neighborhood celebrations makes JLT a great option for young families to stay and socialize.